In addition to the recent ABA Ethics Opinion taking a generally pro-social-media tone, two new judicial ethics advisory opinions have been issued for federal and state judges. First, for federal judges, the Committee on Codes of Conduct issued Opinion 112 in March. It generally condemns various behavior on social media (e.g., “maintaining a blog that expresses opinions on topics that are both politically sensitive and currently active, and which could potentially come before the [judge’s or judicial] employee’s own court,” “any use of a judge’s or judicial employee’s court email address to engage in social media or professional social networking,” and “‘liking’ or becoming a ‘fan’ of a political candidate or movement”). The full Opinion 112 can be found here. The link is also helpful because it contains the full text of the Committee’s opinions from the past five years. As to friending or liking the websites of political candidates, judicial employees other than a judge’s personal staff, courtroom clerks, and court managers may do so subject to the restrictions set forth in Rule 4.1. A judicial employee should not identify him or herself as a judicial employee in so doing and should avoid conduct that may give the impression the employee’s political activities are on behalf of the judiciary. Members of judges’ personal staff, courtroom clerks, and court managers are subject to the same political limitations as judges contained in Canon 4 of the Code of Judicial Conduct, except as provided in Rule 4.3 (Elective Judicial Department Office). By the way, for an interesting Facebook-based disqualification case, see Chace v. Loisel, 2014 WL 258620 (Fl. Dist. Ct. App. Jan. 24, 2014). There, the judge had tried to friend a litigant on Facebook, and the litigant essentially rejected the request based on advice from the litigant’s attorney. The litigant claimed that the judge thereafter issued retaliatory rulings against her because she had rejected the judge’s friend request, and the litigant moved for disqualification. The appeals court concluded that these facts were facially sufficient to warrant disqualification. In the first post-Caperton decision, however, the U.S. District Court for the Northern District of Indiana upheld the constitutionality of canons in Indiana’s revised code of judicial conduct that prohibit judges and judicial candidates from making pledges, promises, and commitments; require disqualification based on a prior commitment; prohibit judges and judicial candidates from acting as a leader or holding office in or making speeches on behalf of a political organization; and prohibit judges and judicial candidates from soliciting funds for, paying an assessment to, or making a contribution to a political organization or a candidate for public office and personally soliciting or accepting campaign contributions other than through a campaign committee. Bauer v. Shepard, Opinion and Order (July 7, 2009). The court relied in part on Caperton. The court also relied extensively on the preamble and comments to the Indiana code, which were based on the ABA 2007 Model Code of Judicial Conduct (the Indiana preamble is identical to the model; the comments are not although they are similar). Wisconsin is not so fortunate, as a federal court there overturned the endorsement clause and other restrictions on partisan political activity even though judicial elections are supposed to be non-partisan by law. Siefert v. Alexander, 597 F. Supp. 2d 860 (Western District of Wisconsin 2009). The court believed the “gag order” was not “fooling anyone” because “many if not most judicial candidates have political lives before their judicial campaigns and often are easily identified as ‘Republican’ or ‘Democrat’ even if they do not explicitly run as such.” What the court fails to recognize is that by requiring judicial candidates to eschew party labels during the campaign, the code ensures that judicial candidates demonstrate their willingness to take on a new role and reject partisan loyalties and embrace judicial independence once on the bench. To promote public confidence in the judicial system, judges are prohibited from engaging in conduct that reflects adversely upon their independence, impartiality, or integrity. Since public trust is damaged by on-bench and off-bench activities, codes of judicial conduct severely restrict a judge’s partisan political activities, private speech, business dealings, social life, religious activities, and charitable endeavors. This Article examines the restrictions placed on a judge’s fund-raising efforts in support of civic, educational, charitable, fraternal, professional, and religious organizations. 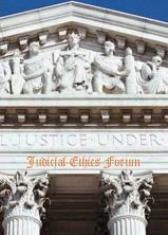 The Article begins by tracing the evolution of judicial fund-raising regulations through the ABA Model Codes of Judicial Conduct of 1924, 1972, 1990, and 2007. Next, specific fund-raising prohibitions of the 2007 Model Code are evaluated against the rational supporting the state’s right to limit a judge’s extra-judicial activities. The Article concludes that some of the 2007 Code’s fund-raising restrictions are justified because they prevent measurable damage to confidence in the judiciary. Other rules, however, prohibit conduct that is either harmless to, or actually enhances, the image of the judiciary. Those restrictions are not justified and should be eliminated. Judge McKoski also recently published a thorough exploration of judges’ private use of their official stationery, which likewise traces (among other things) the ABA’s treatment of the subject through the near century’s worth of Model Judicial Codes. Links to both works can be found in Articles. The federal courts are steadily (and somewhat condescendingly) chipping away at the restrictions on campaign and political activity state courts believed were necessary to protect the impartiality of an elected judiciary. (For the most recent example, see Siefert v. Alexander, Opinion and Order (U.S. District Court for the Western District of Wisconsin Feb. 17, 2009), permanently enjoining enforcement of three clauses in the Wisconsin code of judicial conduct: the personal solicitation clause, the prohibition on endorsing a partisan candidate, and the prohibition on joining a political party). Therefore, it is crucial that state courts adopt a rule prohibiting a judge from using “court staff, facilities, or other court resources in a campaign for judicial office,” which was adopted by the American Bar Association in 2007 as Rule 4.1(A)(10) of the Model Code of Judicial Conduct. Whatever the First Amendment rights of judges and judicial candidates to solicit campaign contributions, answer questionnaires, and endorse other candidates, there is no conceivable grounds for arguing that judges have a First Amendment right to appropriate for personal political purposes the public resources that should be dedicated to the administration of justice. Even without a specific rule, the exploitation of the courthouse and court staff for campaigning by judges is impliedly and inherently in the general provisions of the code. For example, in December, the New York State Commission on Judicial Conduct censured a judge who personally solicited support for her candidacy for another court from two attorneys who were in the courthouse and about to appear before her; the Commission found a violation of the general rule requiring a judge to “act in a manner consistent with the impartiality, integrity and independence of the judiciary.” In the Matter of Yacknin, Determination (New York State Commission on Judicial Conduct Dec. 29, 2008). But adopting an express rule eliminates any question whether such conduct can be sanctioned (see the baffling dissent in Yacknin), ensures that judges are aware of the restriction, and emphasizes the importance of keeping politics out of the courthouse literally as a way of keeping politics from appearing to influence judicial decisions. So far, Indiana, Kansas, and Montana have adopted Rule 4.1(A)(10), with Indiana wisely adding that it applies to “any political purpose” as well as to campaigning. Other states should follow those states’ lead even if they do not adopt entirely new codes at this time. Minnesota adopted a version that states judges cannot “use court staff, facilities, or other court resources in a campaign for judicial office in a manner prohibited by state law or Judicial Branch personnel policies.” Let’s hope that the law and personnel policies in Minnesota are strict and well-known by judges. The Ohio Supreme Court did not adopt the rule when it adopted a new code; let’s hope provisions in other Ohio laws or rules already cover the issue, but it would have been prudent to refer to those standards sin the code as well. Judicial campaign fund-raising was one of the major judicial conduct stories in 2008, as it has been in the past and no doubt will be in the future. Campaign contribution and spending records were set in state supreme court races in 2008. In Caperton v. Massey, the United States Supreme Court decided to take a case raising the issue whether $3 million spent by a company’s CEO in support of a supreme court justice’s campaign presents due process considerations when that company appeals a $50 million verdict to the court. The case prompted the filing of nine amicus briefs in support of the petitioner, most representing the position of several individuals or organizations, and five in support of the respondent (see www.brennancenter.org/content/resource/caperton_v_massey). Oral argument is scheduled for March 3, 2009. Personal solicitation of campaign contributions led to judicial discipline in 2008, with a modern twist to some of the violations. A videotape on YouTube.com showed judicial candidate Willie Singletary telling riders at a motorcycle rally, after offering a blessing for the riders and their bikes, “There’s going to be a basket going around because I’m running for Traffic Court Judge, right, and I need some money. I got some stuff that I got to do, but if you all can give me $20 you’re going to need me in Traffic Court, am I right about that?” The judge further stated, “Now you all want me to get there, you’re all going to need my hook-up right?” He was elected, and the Pennsylvania Court of Judicial Discipline publicly reprimanded him for personally soliciting and accepting campaign funds, conduct “so extreme as to bring the judicial office into disrepute,” and violating the requirement that a judicial candidate maintain the dignity appropriate to judicial office. In re Singletary, Opinion (December 1, 2008), Order (January 23, 2009) (www.cjdpa.org/decisions/jd08-01.html). The Kansas Commission on Judicial Qualifications ordered a judicial candidate to cease and desist from publicly soliciting campaign contributions after receiving multiple complaints that he had sent attorneys a cell phone text message that stated: “If you are truly my friend then you would cut a check to the campaign! If you do not then its time I checked you. Either you are with me or against me!” Inquiry Concerning Davis, Order (July 18, 2008). The Commission found that the candidate personally solicited campaign contributions and that the intimidating nature of the text message violated Canon 1. The candidate accepted the order.